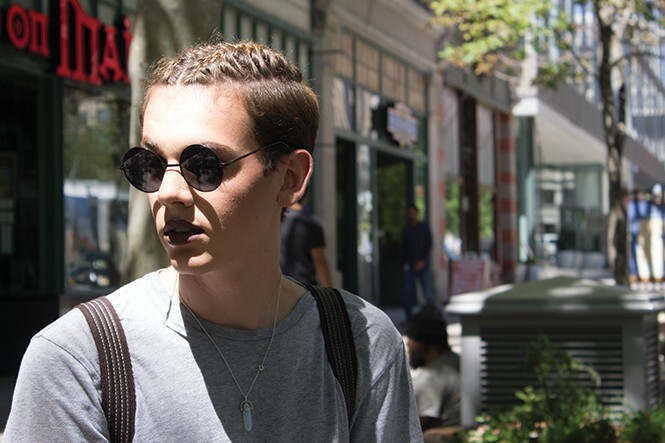 Chris Neve is a 20-year-old makeup artist who has caught the entrepreneurial bug. He recently started a series called The Starving Artists Project that he plans to use to promote art and individuality. His first project is a lipstick-adorned self-guided bike ride from Portland to San Francisco. Neve, who begins his journey Sept. 1, hopes to raise some eyebrows, start a few conversations and, of course, look fabulous during it all. Male makeup artists—especially in Utah—aren't very common. How did you become one? I started by doing theater. Once I got into theater, we had to do makeup for the plays, and I started doing my own because it was always so busy and we didn't have many artists there. I did my own, and thought, 'This is actually kind of fun.' So, I started doing others. At first, I was doing a lot of gory makeup and fantasy makeup. It started from there. Eventually, I started working at Sephora, and that's when I started to try out the beauty makeup. I fell in love. How did you come up with the Is That Boy Wearing Lipstick bike ride? I had a friend who did a bike tour last summer from California to New York. That was really inspiring for me. She was doing it to raise awareness for suicide. I was thinking of this project and I was moving to Portland at the end of August, so I had this crazy idea. I started talking to [my friend] and said, 'Hey, do you think a bike tour from Portland to San Francisco would be doable?' She said I would have to train a lot, but that I could do it. That's when I also put my Is That Boy Wearing Lipstick project and merged them together. Can you tell me a little about your Starving Artists Project? I just started it recently. [Is That Boy Wearing Lipstick?] is my first project for it. It's an organization I am wanting to start, where I have a bunch of different projects within the organization. So, what are you trying to accomplish with the bike ride? So, when I would do my makeup before, I would never wear lipstick because that's kind of big and bold. And then [the Pulse nightclub shooting] happened in Orlando, and with that, at first, I think everyone was fearful, and that's when I realized fear is not the way. Beforehand, I had worn makeup once and I heard out of the corner of my ear, 'Is that boy wearing lipstick?' I realized I was fearful of that and I wanted to stop being fearful, so after Orlando happened, I decided that a way I could stop being fearful in my personal life was just to go bold and not care what people think. I started wearing lipstick a lot more and then everyone started to love it. I still hear, 'Is that boy wearing lipstick?' a lot, but I think that's a cool question because people start conversations and start discussing the topic. If your project series and the bike ride had a message, what would that be? Living without fear would be the message, for sure.